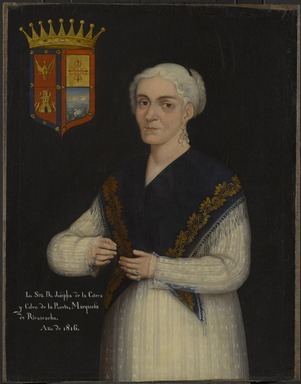 Dona Josefa de la Cotera y Calvo de la Puerta, Marguesa del Rivescacho (dates unknown). An oil painting by an unknown artist dated 1816 in which she is shown as an older woman. Her hair is white and worn in a braided knot in the back of her head. Although her dates are unknown it is known that she was married in 1782. She wears a white dress and a blue shawl that has embroidery around the edges and a gold fringe. She has elaborate earrings on, and rings on both hands on the fourth and fifth fingers. She is shown three-quarter length and view facing to the left side of the picture.